The flame from the Holy Land’s Church of the Nativity in Bethlehem made its trek of nearly 6,000 miles to the U.S. on Dec. 1 and now burns in each of the 10 parishes of Southeast Queens Deanery No. 9. The flame, called the Peace Light, arrived in Queens on the vigil of the first Sunday of Advent. To mark the occasion, a joyful and enthusiastic prayer service was held at St. Joseph’s parish in Jamaica to transfer the flame to each of the deanery’s 12 churches to light their Advent candle at Dec. 2 Masses. Carol Reyes and Maeve Davidson came as representatives of St. Mary Magdalene parish in Springfield Gardens to bring the light to their church. Edith Gallmon of Our Lady of Light parish, which comprises the churches of St. Pascal Baylon and St. Catherine of Sienna, St. Albans, saw the light achieving something else. “This is a way of bringing people back to the Church,” she said. The Peace Light actually arrived at JFK International Airport mid-afternoon on Dec. 1. The journey of the light is a 30-year-old tradition. 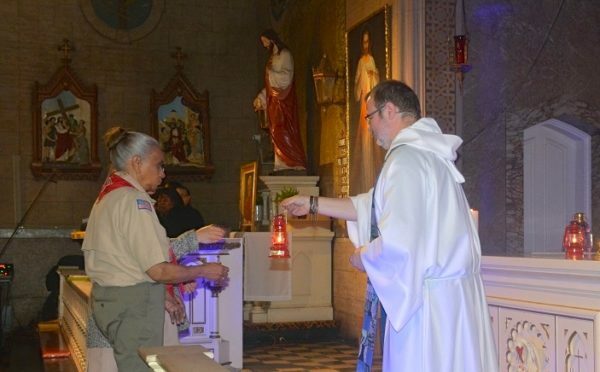 An Austrian company selects a Boy Scout or Girl Scout to go to Bethlehem where a priest transfers the flame of the Church of Nativity’s sanctuary lamp to a lantern. The Scout then flies with the lit lantern to Vienna. The flame is transferred to other lanterns and those go to parishes around the world. Father Chris Piasta, pastor of St. Joseph’s and chaplain of Our Lady of the Skies Chapel at JFK Airport, said it was fortuitous that this year’s journey coincided with the beginning of Advent. At JFK, he received a small red miners’ lantern with the flame. And at the 7 p.m. Saturday service, he processed the lantern from the church’s entrance to the altar and then used a taper candle to light more lanterns. As hymns of joy resounded throughout the nave, representatives of the parishes received their lanterns at the altar rail to take back to their churches. His words were met with a hearty “Amen” from the worshippers’ present. Desiree Johnson and Ina Henderson of St. Teresa of Avila and St. Anthony of Padua parish in South Ozone Park were invited to St. Joseph’s by their music minister Devin Olivas. None of them knew the details of the Peace Light prayer service. They were overjoyed when they learned the special nature of the night’s vespers. Led by Father Anthony Rosado, parochial vicar of St. Clare’s in Rosedale, choir members from different deanery parishes led the nearly 100 people at the service in a litany of hymns that could match any tent revival with contemporary, Caribbean and gospel musical themes. The refrains of many of the songs that reverberated in the 111-year-old church reiterated the coming of the Lord. Father Rosado said the words of each hymn and prayer came directly from the Liturgy of the Hours for Advent. Helen Cureton of Sacred Heart of Jesus parish in Cambria Heights received her parish’s lantern with Sister Vilma Orejola, F.L.P., director of faith formation. Cureton is a liaison between the diocese and the Scouts of America and wore her scout uniform to the service. She said it was important for young people to hear about the Peace Light.